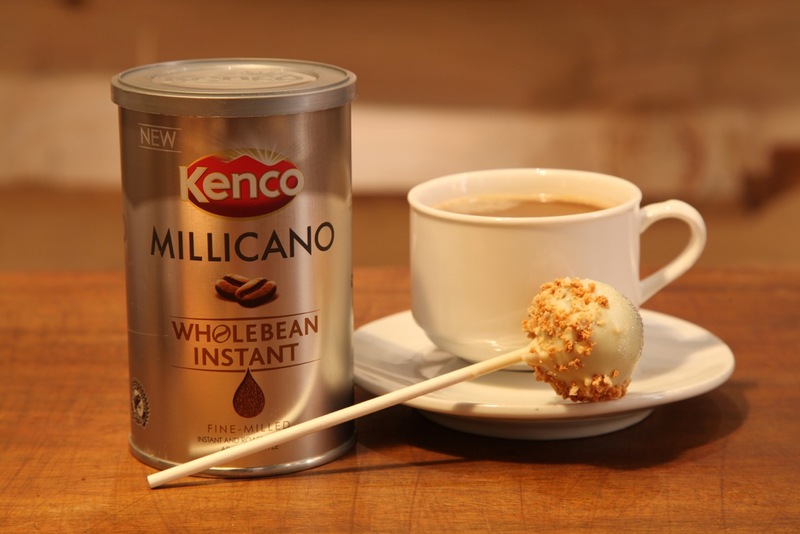 I was lucky enough recently to be invited along to the launch of a fab new instant coffee – Kenco Millicano – Kenco’s first ever Wholebean Instant coffee! It’s the closest thing to ‘proper’ coffee you’ll get in an instant. Available in supermarkets from the 1st March 2011. 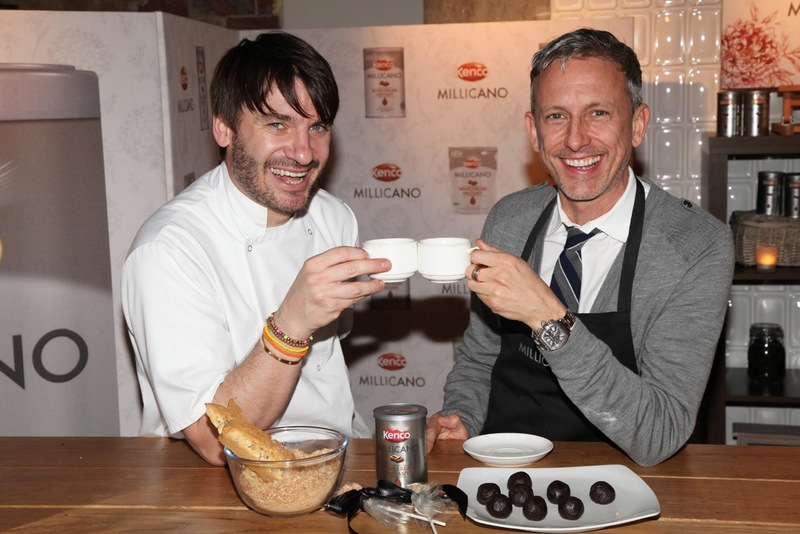 Part of the launch was a demo by super duo Eric Lanlard and Patrick Cox of Cox Cookies and Cake fame. Eric and Patrick showed us how to make seriously delicious choc cherry cake pops – perfect for dipping in your cup of coffee. The lovely folks at Kenco also sent us all home with all the ingredients needed for these little gems – heck it’d be rude not to give them a go! The cake pops are best made with cake that’s not ‘fresh from the oven’ so if you can, try and make the cake bit a day in advance. These are the Kenco cake pops – but I’m going a bit more Pink Whisky with mine. The design is up to you – unleash your creative side! Grease and line an 8″ square tray. Drain the cherries and set aside the juice. Measured 120ml of juice, add it to the cherries and blitz in a food processor or mash them down well with a fork if you don’t have one. Place the chocolate, butter, sugar, brandy (if using) and cherry puree in a pan. Over a low heat stir until the butter and chocolate is melted. Pour into a large bowl and allow to cool slightly. Whisk in the sifted flours, cocoa powder and egg. Don’t worry the mixture is supposed to be runny! Pour the mixture into the tin (square approx 8 x 8″) and then bake for 40-45 mins until firm to the touch. Allow to cool for a couple of minutes before transferring to a cooling rack. In a large bowl beat together the butter, cocoa and icing sugar until you have a lovely smooth frosting. Split the cake in half. You will only need half the cake to make 20 cake pops. You can eat the rest whilst you work! Crumble up the cake into nice fine crumbs. Rub in the chocolate frosting until you have the consitency of a paste. Using your hands roll the mixture into balls approx 1″ in diameter and place them on a tray. If the mixture is sticking to your hands too much try dusting them with a little cocoa powder. Chill the balls to firm them up in the fridge for half an hour. Melt the white chocolate. Take your lolly stick and dip the end into the melted chocolate. Push the stick into a ball about halfway through. Now dip the entire ball into the chocolate to coat. Turn the stick allowing the excess chocolate to drip off. I’m using a block of polystyrene to stab the sticks into so that they can dry upright – rummage around and see what you can find to use – improvisation is the key here! Add a good dose of glitter whilst the chocolate is still liquid. It is important here to get the glitter all over yourself, all over any passing family members and of course all over the kitchen. Add a small chocolate heart decoration, glueing them on with a dab of melted chocolate. These ones here are by Dr Oetker. Allow the chocolate to set and then enjoy with your favourite cup of coffee. Watch out for Kenco Millicano – it hits the shops on the 1st March 2011. If you’ve been inspired by the cake pops please see Bakerella’s website – she’s the cake pop queen! This entry was posted in Cake, Cake Pops, Cherry, Chocolate, Treats. Bookmark the permalink. Oh wow they look absolutely fantastic! I need to have a go! Fantastic looking cake pops ! Now they look absolutely amazing but i'd have to have about 6 at a time lol! Gorgeous cake pops, I love the glitter and heart combo! I’ve made plenty of cake truffles which are essentially cakepops minus the sticks and they always go down a treat. I use Martha Stewarts Devil Food cake as a base and just throw in a little frosting to bind the crumbs. It’s a brilliant way to use up leftover bits of cake after I make a carved cake. I usually roll the balls, place them on a baking paper lined tray, wrap well in clingfilm and freeze them if I don’t have time to finish the truffles at that time. It also helps to solidify the chocolate when dipping them. I love to make them look like chocolates by placing them in mini metallic cupcake cases. I’ll definitely be giving them a go as pops to try out a few different methods and combinations; I’ll definitely be using glitter too! they look so amazing but I feel like i'm destroying the cake by crumbling it… am i weird? These look fabulous, Ruth! I love the idea of dipping them into coffee. I'm also a big fan of Bakerella. I really want to make these! They look so good – I love the purple glitter! Dom – I'm with you there – I had to take a deep breath before crumbling the cake! Deb – try The Co-op, Asda and Sainsburys I've seen them in all of those, generally the bigger stores though! They look so pretty, and what a cute idea! These look great – I bet my kids would love these! Rather good that you get to keep the other half of the cake too. where do you get the edible glitter from? they look amazing you make it look so easy!! I just had to say Thank you for this post – not only will I be making some gorgeous cake pops but I have just bought some Millicano coffee and it is lovely. At last an instant coffee that tastes like coffee should! These went down a treat! I didn't have lolly sticks so made them into balls instead. Ran out of white choc so did some dark choc…they were a bit too rich. The white choc nicely balanced out the bitterness of the dark choc.Thanks for the recipe! I was there too and have not done my post yet! Sorry not to have met you. It was a fun evening! These are beautiful and they sound absolutely yummy. I may try them for Easter treats! Hi Ruth, I'm planning to make these for my cousin's mendhi party, they look fab! One question, how many does this recipe make? And how many packs of glitter did you use? Excellent, thanks a lot – gotta make at least 120! Hi Ruth – please could you tell me where you got this glitter from? I have lots of other colours but I really like this purple and white chocolate combo. Thank you. I was just wondering where you can get the Glitter and Lolly Pop sticks from? beautiful!! wish we could get the glitter and all the pretty stuff here.. we live in israel..
Can you please tell me what size of pop sticks you used to make the choc chery cake pops? I am thinking of making these for my daughter’s 21st. I live in Brisbane, Australia and I have never seen these cakes pops anywhere.